One of my favorite aspects of saltwater fishing is the unexpected. This may arrive in the form of weather and water conditions (read, lightning strikes, big waves, and scary) or in surprise catches. For instance, on the first day I ever fly fished for tarpon I saw several fish swimming by and decided to throw my Cockroach fly at them, just to see if they would notice. Once the fly landed I gave it a twitch and the last fish in the group peeled off and inhaled it. And what kind of fish was that, you ask? Nothing less than a permit! This came about a half hour after I’d landed a tarpon while cruising out of a cut on the Atlantic side of Marathon, Florida. Needless to say, the luck ran out and it took me eons to catch another tarpon and, to this day, I haven’t had another permit on the line. Over the years I’ve caught all sorts of fish on saltwater trips and in some cases I had no idea what they were. 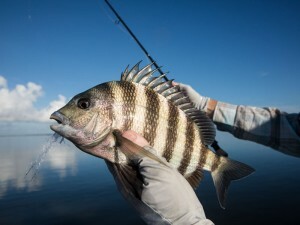 But a couple weeks ago, while targeting redfish in Florida’s Mosquito Lagoon, just off the Space Coast, I spotted a fish an instantly knew what it was—sheepshead. I’d seen these fish in Louisiana and in Mosquito Lagoon when I last fished it (I can’t remember the year, but I do remember that the Vikings lost to the Saints in the NFC championship during my visit and that still leaves a bad taste).